GatherSage shows you if you can collect tradeskill items based on your current skill in that profession. It displays this information in the tooltip when you mouse over a tracked item on the minimap (Herb or Ore node) or the item in the worldframe (Herb, Ore Node, Skinnable corpse) or in your inventory (Millable herb or Prospectable ore). Supports Mining, Herbalism, Skinning, Milling (Inscription), and Prospecting (Jewelcrafting). Will only show necessary skill levels if you posses the matching profession. 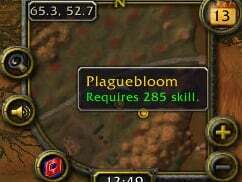 -- Modifies the tooltip for Mining and Herbalism nodes, Skinnable corpses, Millable herbs and Prospectable ores. -- Displays title in green if you have the skill needed to harvest, red if you do not. -- Displays the amount of skill required so you know how close you are. -- Tells you if there are special items that can be harvested in addition to the obvious. -- Works on minimap nodes, so you don't have to search for one that you might not have the skill to harvest yet. Skinning is still a Work-in-progress as the progression between levels changed and I am still tracking down the correct sequence. If you not an incorrect Skinning level please let me know. I believe the inscription/milling issue should now be resolved. Unfortunately, the skinning numbers are tweaked but still a best guess since my PTR account is still considered CT and i cannot get to Pandaria. Which means I cannot verify the skinning levels needed for mobs 86, 87, 88. If you are leveling a skinner and your numbers dont match mine, please let me know..! itemname = "Green Tea Leaf"
ttLine1 = "Green Tea Leaf"
This is while using version 4.6 as the only addon enabled. Thanks. I should have updated Skinning numbers today so I'll incorporate that as well. Last edited by Sithehenn : 10-11-12 at 02:52 PM. working on updating this week. Not rushing or update bagging just a simple question. Will GatherSageCT be updated for MoP or will a new addon (like GatherSageMoP) replace it? thanks for catching that.. i sure hate it when they make these kind of changes with no documentation. even wowpedia is still wrong too. You have the TOC set to 40300, which WoW reads as "out of date". Currently the client only reads 40000 as the "correct" date. Last edited by Csalago : 12-13-10 at 02:54 PM. GatherSageCT updated to include prospecting data now. All preliminary gathering tradeskills should be covered at this point. If you find some data that is incorrect, please let me know so I can get it updated.